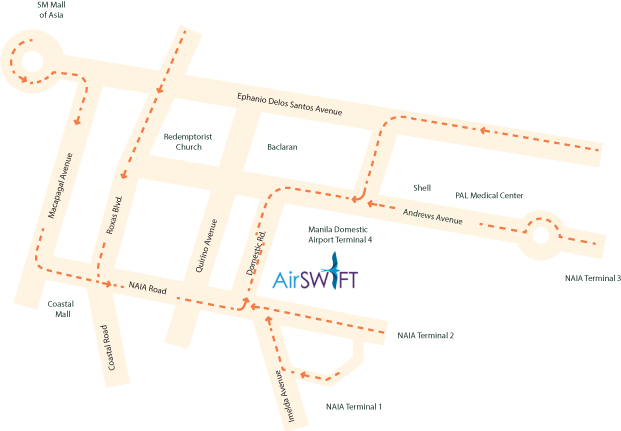 AirSwift is located at Manila Domestic Airport Terminal 4, Andrews Ave, Pasay, 1300 Metro Manila. Airswift, offers daily flights from Manila to El Nido, Palawan. Travel time is approximately 55-minutes using a 50-seater ATR aircraft. Flight reservations may be made directly through Airswift. Regular flights depart Manila at 6:30AM, 11:00AM and 2:00PM daily. Return flights depart El Nido, Palawan at 8:00AM, 4:00PM, 5:10PM daily. Hotel Covo is only 5 minutes away from Lio Airport. The hotel provides complimentary shuttle service based on Airswift’s daily flight schedule. El Nido is also accessible by sea from Coron, Palawan. It takes approximately 3 and a half hours to travel from Coron, Palawan to El Nido, Palawan via Montenegro Shipping Lines' fast craft.